Blog > Cannabis Education > New Patient Guides > What Are Cannabinoids & How Do They Affect Your Cannabis Use? What Are Cannabinoids & How Do They Affect Your Cannabis Use? Imagine, for minute, that you’re a patient with a life-threatening form of epilepsy. Every day a series of electrical storms originating in your brain render your daily existence a living hell. Anticonvulsant medication, radical diets, and invasive procedures provide marginal relief, but they leave you feeling like a zombie. In the end, no matter what the conventional treatment, the seizures always return. Incredibly, medical marijuana, the same drug your parents used to smoke before rock concerts, seems to zap your seizures before they zing you. You can thank compounds called cannabinoids for that, but what are they? It seems too good to be true, but respected physicians and accredited researchers agree—cannabis can stop a grand mal seizure in its tracks. Scientists aren’t exactly sure how pot alleviates convulsions, but they believe one particular cannabinoid, called CBD, helps to calm excessive electrochemical activity, which is responsible for epileptic seizures. Epilepsy is just one condition that pot seems to offer dramatic forms of relief. Muscle spasms, depression, PTSD, and arthritis are distinct conditions, but marijuana can counteract each of them and many others. What accounts for pot’s seemingly miraculous versatility? More specifically, how can it boost serotonin levels in depressed patients and dampen pain signals in arthritis victims, yet calm the nerves of war vets suffering from PTSD? The answer lies in the literally hundreds of beneficial compounds found in marijuana. These include THC, CBD, and other cannabinoids that bind to specific receptors in the body. In fact, marijuana is something of an alphabet soup of substances that can address specific deficiencies and imbalances in the body’s neurochemistry. The more you study how cannabis interacts with the body, the more you realize that this plant seems tailor-made to promote homeostasis and wellness. Let’s take a look at cannabinoids in action and how they can promote optimum health. Cannabinoids Make Marijuana a Wonder Drug? Homeostasis is probably the most important concept when it comes to health. In everyday language, it refers to the way the body aims to maintain its balance by regulating itself. To do this, a network of hormonal signaling called the endocannabinoid system regulates bodily processes that involve pain signaling, cellular repair, and the like. Endocannabinoids are chemical messengers that the human body produces naturally; they bind to receptors in the brain, the nervous system, and cells throughout the body. Essentially, endocannabinoids are like the “keys” that either trigger or “unlock” receptors in the endocannabinoid system. A quick glance at how this system works can not only help explain how disease arises, but also how medical marijuana can promote health. Let’s imagine that you stubbed your toe while exercising. Inflammation causes damaged tissue, resulting in pain signals being sent to your brain. Maybe you even let out a curse word under your breath (or perhaps not so subtly); depending on the severity of the injury, you know it’s only a matter of time before you’ve completely forgotten your little mishap. Ultimately, endocannabinoid signalling is what causes the body to adjust to changing internal or external conditions. As with your stubbed toe, the endocannabinoid signals will instigate a chain reaction of cellular processes aimed at stabilizing the damage and repairing it. The endocannabinoid system, of course, is far more complex that our simple example suggests. In fact, it’s instrumental in regulating not just pain signaling, but also psychological mood, immune function, and many other bodily processes central to our health and well-being. So much so that many scientists now believe the impairment of the endocannabinoid system may be the root cause of fibromyalgia, MS, arthritis, depressive disorder, and a host of other diseases. Medical marijuana is loaded with literally hundreds of compounds called phytocannabinoids, which is just a fancy way of saying cannabinoids derived from a plant source. Essentially, the cannabinoids in marijuana either mimic or counteract the endocannabinoids our body naturally produces. As mentioned, some researchers have proposed that impairments or defects in the body’s endocannabinoid system may be responsible for many common illnesses. They’ve labeled this proposed spectrum disorder Clinical Endocannabinoid Deficiency (CECD). Unfortunately, federal restriction on cannabis research has greatly hampered the studies that would shed light on this topic. Nevertheless, anecdotal reports and many clinical studies indicate that numerous health conditions respond well to cannabinoid-based medicines. CB1-R: These are the receptors that THC, the psychoactive ingredient in marijuana, bind to. Health experts believe that when THC binds to the CB1-R receptors the result is a dampening of neuropathic pain, muscle spasticity, nausea, and seizures. 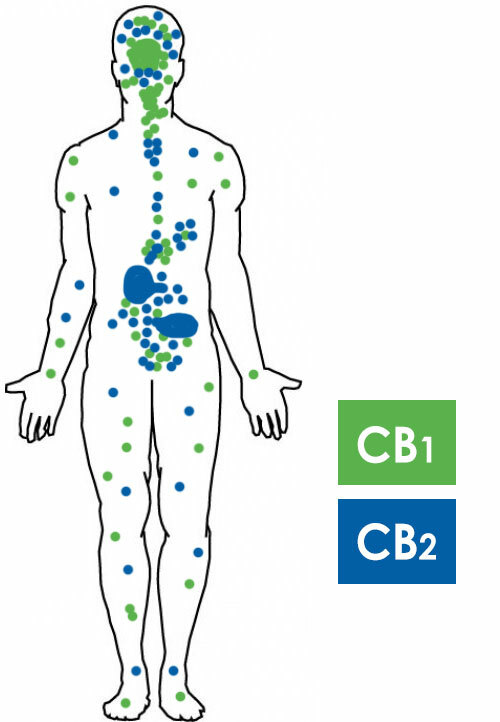 CB2-R: These are the receptors that other cannabinoids, like CBD, bind to; they’re thought to govern immune function and anti-inflammatory response. Emerging evidence suggests that cannabinoids in marijuana work via these receptors to counteract inflammatory and autoimmune diseases. TRPV1: These receptors are involved in the detection and regulation of temperature. Less is known about this type, but researchers believe cannabinoids targeting these receptors may dampen neuropathic pain signaling. Research on medical marijuana and its impact on the body’s endocannabinoid system is still in its infancy. However, the clinical studies conducted so far suggest that cannabis-based therapies hold tremendous promise for treating conditions that stem from deficiencies in the body’s endocannabinoid system. Recently, a landmark report conducted by the National Academy of Science, Engineering, and Medicine concluded that marijuana is undeniably effective in treating pain, nausea, and muscle spasticity. The authors of the study urgently called for lawmakers to lift federal restrictions that prevent large-scale clinical studies from investigating marijuana’s potential as medicine. The potential health benefits of cannabinoids in marijuana—specifically their ability to remedy deficiencies in the body’s endocannabinoid system—are too promising to ignore. Indeed, investigators have identified a range of individual cannabinoids and the conditions they’re very helpful in treating. CBD: A powerful anti-inflammatory and anti-tumor agent. THC: Known to help reduce pain, nausea, and seizures. THCA: A highly effective anti-spasmodic. CBDA: Known for its antimicrobial benefits. CBC: Thought to have neurogenic and antidepressant effects. CBDV: Has shown promise in the treatment of epilepsy. THCV: Believed to help reduce anxiety and panic attacks. CBG: Evidence suggests it can promote bone growth and inhibit cancer cells. CBN: Is believed to promote a sedative effect. Individual cannabinoids hold great promise in helping researchers develop targeted therapies, though many experts believe whole-plant therapies may represent the best approach since individual cannabinoids seem to have a synergistic effect on one another. Essentially, they’re more effective collectively than isolated. Scientists call this phenomena the “entourage effect,” referring to the fact that the whole plant is more than the just the sum of its parts. In all probability, the future of medical marijuana will entail specific strains that contain the appropriate ratio (or combination) of cannabinoids suited to particular endocannabinoid deficiencies. There are at least 60 molecules in marijuana classified as cannabinoids. THC has a neuroprotective effect and may promote the growth of new neurons. THC in mainly responsible for weed’s psychoactive properties, but CBN and CBDL also have mind-altering effects. CBD is not psychoactive, but it’s attracting great interest among the medical community for its health benefits. 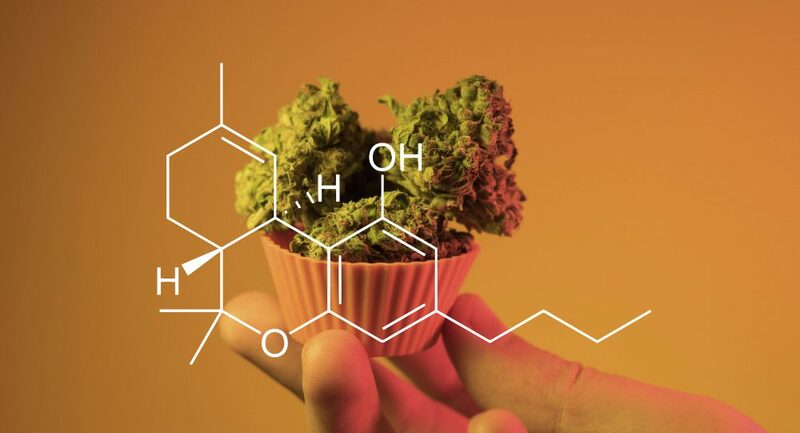 CBD reduces the intoxicating effects of THC. CBD and THC interact with the body through different neural pathways, but they have many similar medical benefits. There’s an amazing correspondence between the phytocannabinoids in marijuana and the body’s endocannabinoid system. The notion that compounds in cannabis can alleviate epileptic seizures, dampen pain signals, stimulate appetite, improve creativity, lessen anxiety, and boost mood is truly amazing when you think about it. The body’s endocannabinoid system is so central to our well-being and medical marijuana is so exceptionally abundant in compounds that appear to both modulate and remedy its function. For years, aspirin—which is made from willow bark—has been hailed as a “wonder drug.” But given medical marijuana’s unmatched versatility and effectiveness, it may deserve that term even more. Perhaps “miracle drug” is more like it. My wife and I have our Medical cards from you guys at Nugg. They expire in March. The dispensary that helped us with our cards is no longer in business and our current dispensary does not offer this service. Can you help me?